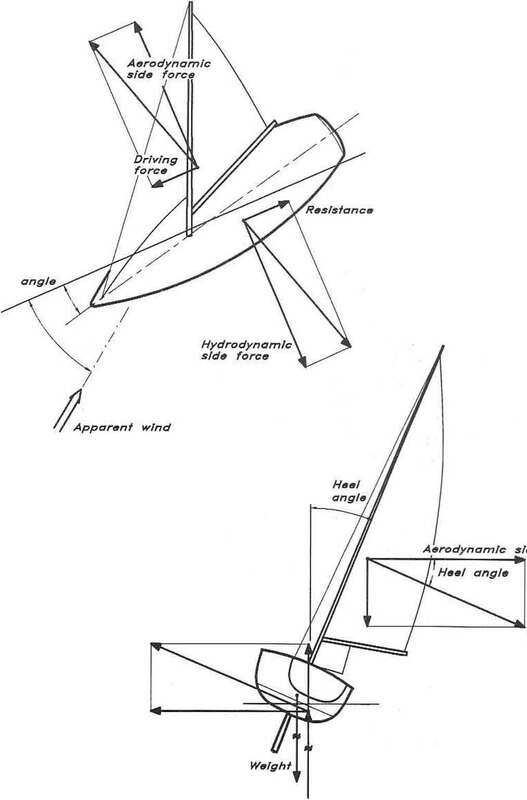 Forces and moments Fig 5.1 shows the different forces acting on a sailing yacht. In the plan on a sailing yacht view the horizontal components of the forces are displayed. When the hull is driven through the water a resistance is developed. Under equilibrium conditions, when the yacht is sailing at constant speed in a given direction, the resistance has to be balanced by a driving force from the sails. Unfortunately, this cannot be created without at the same time obtaining a side force, which in turn has to be balanced by a hydrodynamic side force. The latter is developed by the underwater body when sliding slightly sidewards, ie when the yacht has a leeway angle. Since the turning moment under equilibrium conditions must be zero, the resulting hydro- and aerodynamic forces (in the horizontal plane) must act along the same line. The view at the bottom of Fig 5.1 is along the direction of motion. It is seen that the resulting hydro- and aerodynamic forces are at right angles to the mast. This is not necessarily exactly true, but it is an approximation that is always made in sailing yacht theory. The heeling moment from the aerodynamic force is balanced by the righting moment from the buoyancy force and the weight. In Fig 5.1 the apparent wind direction is marked by a fat arrow. This is not the true wind direction, since the wind felt onboard the yacht is influenced by its speed through the air. Fig 5.2 illustrates the relations between the true and apparent wind speeds and directions, the so-called velocity triangle. Note that the wind created by the yacht speed (which must be used when adding the wind vectors) is opposite to the arrow-shown as yacht speed in the figure. This chapter will deal mainly with the resistance force and its components, and how it can be minimized by proper design. The side force will be considered in the next chapter in connection with the discussion of keels and rudders, sincc these have primary responsibility for the side force production.